In an April 6 news release, Dye, who spent part of the day touring the Lower Granite Dam that spans the Snake River and connects Whitman and Garfield counties, expressed concerns that a single judge is making rulings that affect the availability of inexpensive electricity, a burden that eventually would be borne by Northwest ratepayers. "It is imperative that all biological data be examined prior to making decisions that create such significant impacts," Dye said. "There are questions whether this forced spill of additional water will help the fish." According to information from Newhouse's staff, the spill has the potential to affect river transportation, flood control and irrigation systems. Newhouse announced during the meeting news of federal legislation sponsored by Congresswoman Rep. Cathy McMorris Rodgers (R-Spokane) that would require the Bureau of Reclamation, the Bonneville Power Administration and the U.S. Army Corps of Engineers to operate the Federal Columbia River Power System (FCRPS) in a manner consistent with the endangered species act. Newhouse said he's confident this legislation will be adopted. According to an April 10 news release from McMorris Rodgers' office, the House Natural Resources Committee was scheduled to hold a legislative markup on the bill on April 11. Dye said she recognizes ongoing investments in fish passage improvements to the Snake River dams. At the same time, she expresses frustration that many people don't acknowledge the benefits of these structures to overall fish survival. The spring spill over the lower Snake River dams started Tuesday, April 3. 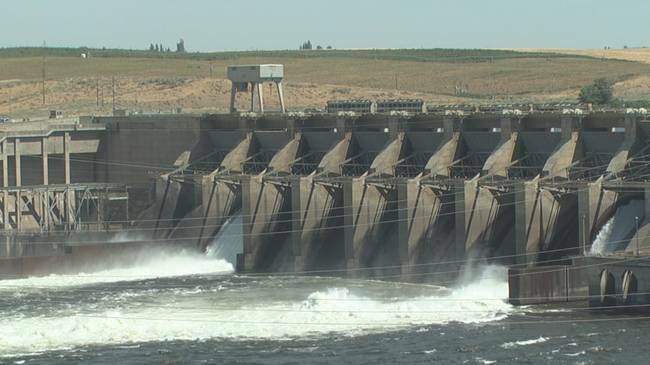 The spring spill over the lower Columbia River dams was to begin April 10.